Credit: NGC 6266 - NASA/CXC/MIT/D.Pooley et al. ; NGC 7099 - NASA/CXC/UIn/H.Cohn & P.Lugger et al. NASA's Chandra X-ray Observatory has confirmed that close encounters between stars form X-ray emitting, double-star systems in dense globular star clusters. These X-ray binaries have a different birth process than their cousins outside globular clusters, and should have a profound influence on the cluster's evolution. A team of scientists led by David Pooley of the Massachusetts Institute of Technology in Cambridge took advantage of Chandra's unique ability to precisely locate and resolve individual sources to determine the number of X-ray sources in 12 globular clusters in our Galaxy. Most of the sources are binary systems containing a collapsed star such as a neutron star or a white dwarf star that is pulling matter off a normal, Sun-like companion star. "We found that the number of X-ray binaries is closely correlated with the rate of encounters between stars in the clusters," said Pooley. "Our conclusion is that the binaries are formed as a consequence of these encounters. It is a case of nurture not nature." A similar study led by Craig Heinke of the Harvard-Smithsonian Center for Astrophysics in Cambridge, Mass. confirmed this conclusion, and showed that roughly 10 percent of these X-ray binary systems contain neutron stars. Most of these neutron stars are usually quiet, spending less than 10% of their time actively feeding from their companion. A globular cluster is a spherical collection of hundreds of thousands or even millions of stars buzzing around each other in a gravitationally-bound stellar beehive that is about a hundred light years in diameter. The stars in a globular cluster are often only about a tenth of a light year apart. For comparison, the nearest star to the Sun, Proxima Centauri, is 4.2 light years away. With so many stars moving so close together, interactions between stars occur frequently in globular clusters. The stars, while rarely colliding, do get close enough to form binary star systems or cause binary stars to exchange partners in intricate dances. The data suggest that X-ray binary systems are formed in dense clusters known as globular clusters about once a day somewhere in the universe. Observations by NASA's Uhuru X-ray satellite in the 1970's showed that globular clusters seemed to contain a disproportionately large number of X-ray binary sources compared to the Galaxy as a whole. 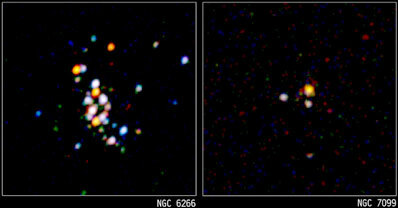 Normally only one in a billion stars is a member of an X-ray binary system containing a neutron star, whereas in globular clusters, the fraction is more like one in a million. The present research confirms earlier suggestions that the chance of forming an X-ray binary system is dramatically increased by the congestion in a globular cluster. Under these conditions two processes, known as three-star exchange collisions, and tidal captures, can lead to a thousandfold increase in the number of X-ray sources in globular clusters. In an exchange collision, a lone neutron star encounters a pair of ordinary stars. The intense gravity of the neutron star can induce the most massive ordinary star to "change partners," and pair up with the neutron star while ejecting the lighter star. A neutron star could also make a grazing collision with a single normal star, and the intense gravity of the neutron star could distort the gravity of the normal star in the process. The energy lost in the distortion, could prevent the normal star from escaping from the neutron star, leading to what is called tidal capture. "In addition to solving a long-standing mystery, Chandra data offer an opportunity for a deeper understanding of globular cluster evolution," said Heinke. "For example, the energy released in the formation of close binary systems could keep the central parts of the cluster from collapsing to form a massive black hole."